There are a lot of factors to take into consideration when choosing to get eyelash extensions done, from the type of lash to get to the length of the extension to the upkeep it will require. Nowadays most salons offer lash extension services, but it’s important to do your research and make sure you’re going to a reputable stylist that knows what they’re doing. If you’re considering extensions but don’t know where to start, we talked to Christian Zamora, makeup artist, lash extension pro, and “Master Eye Stylist,” to get the ins and outs of eyelash extensions and to help you on your way to envious lashes. Lash extensions are usually either synthetic, silk or mink. “It started out there were just synthetic lashes because that’s what strip lashes used, but the synthetic lashes began to damage the lashes because they were so heavy,” Christian explained. Choosing the right hairs comes down to how your lashes are naturally. If you have thick, coarse hair, a synthetic lash can work for you: “It’s a heavier lash and the natural lashes can support it.” If you have fairer skin, chances are your hair is much finer. Christian suggests going for a silk lash in this case, since it’s much lighter than a synthetic lash. As for mink lashes, anyone can pull them off and achieve a very natural effect. “A person with really thick lashes can do a mink lash. It won’t make them look much larger or fuller, but it will make them look much softer and kind of fluffy…. Somebody who has very, very fine lashes, almost non-existent, can do a mink lash and it will make them look like they have a natural lash line.” Keep in mind that mink lashes are more of a luxury, often costing $100 more for the service. MORE: Mink Lash Extensions: Are They Worth the Fuss? Extensions are usually good for 4-6 weeks. 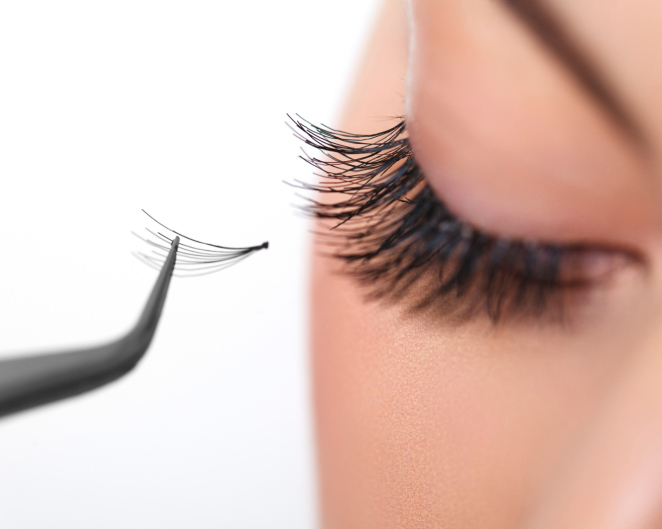 Depending on the growth of your lashes, you may need to go for touch-ups after as little as 3 weeks. “It really depends on the adhesive that you use.” In Christian’s studio, he uses an adhesive that requires maintenance with oil. “A lot of the adhesives don’t use oil so the lashes can get really dry at that point.” But his biggest tip? Brush out and separate your lashes with a lash comb every time they get wet: “What happens is, as they dry, they’ll come together. After a while the adhesive begins to break down, so as one lash sheds, it’ll pull everything out with it and will leave a hole in your lash line.” Yikes!